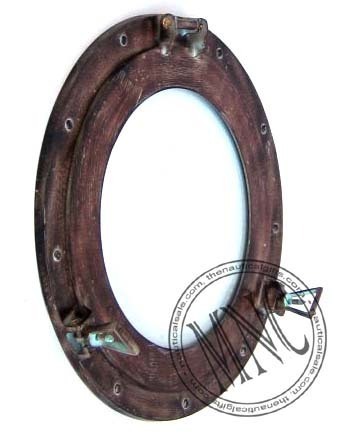 We are specialized in manufacturing a hug range of Aluminum Antique Porthole Mirrors, which are available in various specifications as well as dimensions. These products are manufactured using high quality raw materials using sophisticated technologies and are available with customized solutions according to the client’s bulk requirement. Our products are used in different industries and are easily available in the national as well as international market. Marico nautical collection is a professional manufacturer of fine nautical gifts and instruments. Our company is accomplished in the design of fine products and nautical gifts. Our manufacturing techniques require the highest standards possible. We combine the finest raw materials and optics along with the aesthetic appeal of hand-polished solid brass, rich genuine leather and hand finished oak, teakwood, or mahogany. Since 1978, we have produced fine products and nautical gifts for about 30 years. We are good at both of machining wood and metal, and have brought up a group of reliable cooperators. The rich manufacturing and management experiences and high standards of working enable us to offer high quality products and reliable services. All of these has carried our products into the world market, and we are currently exporting our products to the whole world market.